A moist yellow sponge cake, brushed with black raspberry liquer, filled with raspberry mousse, and iced with vanilla buttercream. Decadent rolled white chocolate envelops this beauty. A moist yellow sponge cake is brushed with black raspberry liquor, filled with raspberry mousse and iced with vanilla buttercream. It's covered with rolled white chocolate and decorated with delicate chocolate piping and gel "jewels". 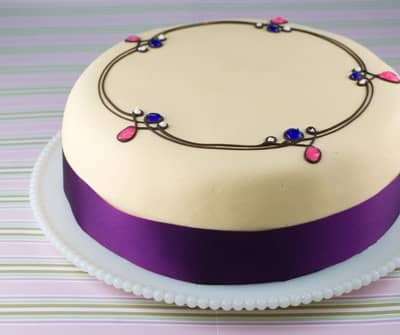 The bottom is adorned with a beautiful ribbon. This Cake can only ship Next Day Air and shipping cost is $33.00. If you want a lower cost shipping please pick any of the other cakes.